If you are a Bookworm and love to read and listen to Audio-books but don’t have an idea where to find Audio-books from Indian authors or books written in Indian languages, then we suggest you try Storytel. There are many other apps from well-known brands like Amazon and Google but they don’t have much for Indian users. Storytel a cool app which lets you read and listen to thousands of Audiobooks available in English, Hindi, and Marathi. In this post, we are presenting a brief review of this cool app called Storytel. Storytel was founded way back in the year 2005 and today it is one of the Top Grossing apps in Play store. It is basically a subscription based service where users can listen to thousands of audiobooks and save them offline. Presently, Storytel is serving in 9 countries including Denmark, Russia, and India. Apart from AudioBooks, it also has a huge collection of eBooks. So, you can either read the books or listen to them as per the need. Storytel audiobooks can be listened to via your Smartphone, Tablets, or Desktop computers. You can simply log in to their desktop website or download their app. Storytel app is available on Play Store and Apple App Store. 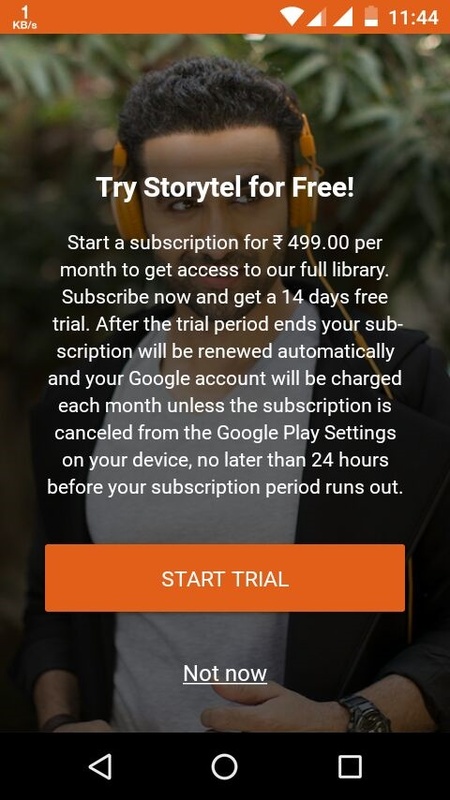 You first need to create a Storytel account to get the 14 days of free trial, after that you can continue the service by paying a nominal amount per month. You can either listen to the books online or save them offline. The later one is recommended if you don’t have a stable Internet Connection. Let’s have a look at some the features of Storytel which makes it a perfect AudioBook service for a Bibliophile. Unlike other AudioBook Service providers, Storytel has been well structured and its wide collection is easy to navigate through. You can listen to 10,000+ Audiobooks available- from bestsellers to action thrillers, weighty biographies, or breathtaking novels. Searching for your favorite Books is no more a difficult task because they have been divided into different categories such as Biographies, Children, Classics, Fiction, non-Fiction, and Thrillers. You can also search your favorite reads by typing Book Title or Author name in the Search option available. 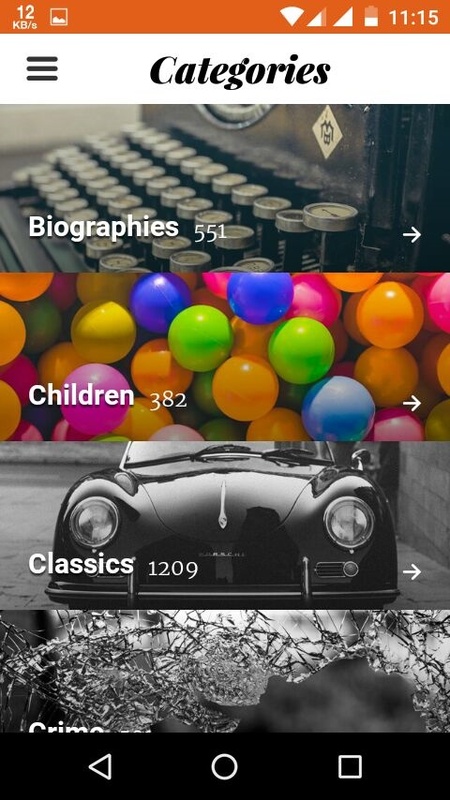 One interesting feature that I found about Storytel is that you can save as many books you want and listen to them later. This means you can also listen to your favorite Audiobooks when you don’t have an Internet Connection. Most of the AudioBooks service providers require an active Internet Connection, saving them offline allows you to listen to AudioBooks when you don’t have a stable Network. Features like Gift a Book and Share a Book allows you to send and send Audio-Books with your friends. Storytel Audio Books can be listened on Desktops as well as on Mobile and Tablets. You can download the Storytel app and enjoy listening to audiobooks on the go. Their User Interface is quite easy to use and it is fairly easy to use. You can set the sleep timer which will automatically stop the Audio Playback after a certain duration. You also get a playback control just like a normal Music Player to control the Playback speeds (fast-forward, fast-backward). It also automatically syncs users progress while you are listening to the audiobooks. Wouldn’t it be difficult for you to manually mark the progress of the book so that you don’t need to waste your time in figuring out from where should you resume the playback? One thing that I liked a lot about Storytel is its large of Audiobooks of Indian Authors. You can find series like Mrutyunjay and Chhava Prakaran to great Biographies of Swami Vivekanand and Dr. A.P.J Abdul Kalam. Regional books are also available in Indian languages like Marathi and Hindi. Titles from more Indian languages are in pipeline to the list. This cool AudioBook service is also recommended for children as there is one special section for kids. You can play stories of Munshi Premchand, Poems, and ancient tales like Mahabharata and Ramayana. Storytel comes with an inbuilt eBook reader feature. This means you can listen to your audiobooks or read the eBooks like the way you want. You can switch between different chapters of the book and mark the pages as Bookmark. You can also manage the size of the fonts from the Reader’s Settings. There are 3 different themes available for eBooks: White, Sepia and Night. Night mode is useful when you are reading the eBooks at night and you don’t want to strain to your eyes. This service is very much useful for the busy Indian lifestyle where we have a desire to catch up with our favorite books but don’t have time to read it. Audiobook format allows anywhere and anytime flexibility to the users. Storytel trial version is free for 14 days. You can enjoy the fully paid service free for the initial 14 days, after that you need to pay Rs 499 per month to continue the service. This is a subscription-based service so you can cancel the subscription anytime and you will get a termination mail for the same. Remember that you need to pay via your credit/debit card and you can’t use Google Play Store In-app purchases for the payment. 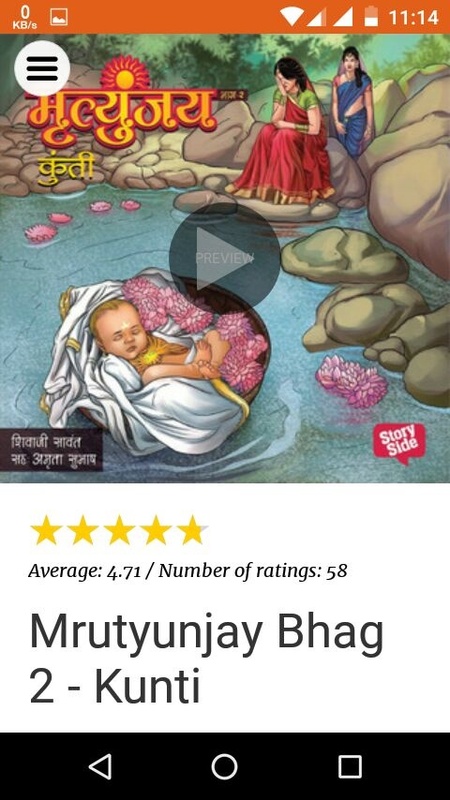 Storytel is a great app providing a large collection of free audio-books in English, Hindi, and Marathi. If you like reading Books and often purchase Audio Books which are more expensive than normal books, we recommend you to try Storytel. It would be much cheaper and you can explore their large collection without paying for them separately. Storytel also allows you to share the same account on 2 different devices. So, you can easily share the subscription with your Bookworm friend and enjoy the service at half cost. The only thing which needs to be improved in this app is its User Interface. It may be a bit confusing for the first time users, but after some time you will have a great experience with this service. So, this was a brief overview of this cool AudioBook Service which we recommend to all of you. However, if you have any queries/suggestions you may comment down below. We would always love to hear back from you.